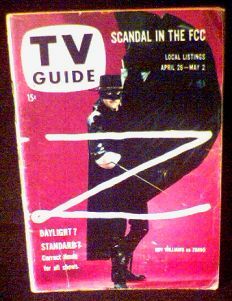 April 1958 Virginia edition of TV Guide with old style logo, featuring cover article on Zorro. No loose pages or tears. Some pencil notations inside and crossword has been filled-in in pencil. I loved to watch Zorro as a kid, and I still tune-in on the Disney channel. Guy Williams was the best. The TV Guide article gives some interesting background on Williams. Website design and hosting by Sohodojo Business Services. Item 466 of 466 items displayed in viewer. 0 items in cart.